How Do I Keep My Senior Cat Active and Comfortable? Q. How can I make my senior cat more comfortable? She seems to be moving more gingerly and doesn't jump up and down as easily. A. As your cat gets older, slower and less active, the key thing to remember is that she still needs exercise. Regular, gentle play is truly one of the secrets to feline health and happiness. As your cat ages, continue to give her a minute or two of play here and there throughout the day. Batting at a big peacock feather or pouncing on a catnip mouse will help to keep her muscles, joints and reflexes in good condition. And don't forget the benefits of "brain games" — use food puzzles to keep her body moving and her mind active. Above all, don’t let her put on the pounds. 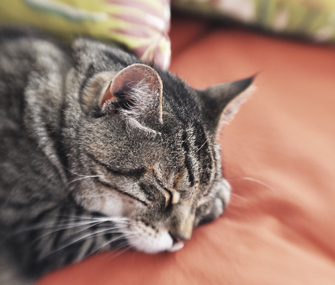 Extra weight puts more pressure on your cat’s joints and clogs up the efficient engine of her internal systems. If anything, keep your senior cat on the lean side of normal. Choose cat beds that are well-padded and warm. If your cat has arthritis, consider adding egg crate-type padding for extra cushioning. Offering a couple of different beds in separate rooms, ideally in sunny spots, will give your cat ways to both catch her naps and stay close to you. If you do have multiple beds, try mixing up the fabrics — you may find your cat’s favorites change depending on the weather and her mood. Give her a step up. Many companies make stairs and ramps to help pets get to their usual favorite places. These are often lightweight, well-designed and collapsible, or attractive enough (in the case of stair-steps) to leave as a permanent part of the decor. Of course, you also need to make sure your cat is in good health. Getting older isn't optional, but suffering from age is often preventable. Work with your veterinarian to make sure all your senior cat's health issues are being treated or managed. Is My Pet Sick or Just Getting Older?